Early in his architectural career, David worked on the design of the U.S. Embassy in Amman, Jordan. He later contributed to the master plan for the campus of Houston’s Texas Children’s Hospital. Since then he has worked on various healthcare projects in the Texas Medical Center (TML), around Texas and beyond. In 1999, he started his own company as a sole practitioner with a broad, diverse portfolio that presents work completed on health care facilities, commercial businesses, individual residential projects and other related commissions. As a small business owner, David maintains a list of projects mostly located in the Houston area and has taught a graduate-level course for Texas Tech University in their Houston Practicum called "Infrastructure in the Urban Environment”, and currently serves on Rice Architecture’s William Ward Watkins Council. 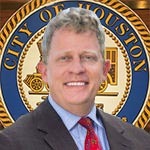 Council Member Robinson is Chair of the Transportation, Technology, and Infrastructure Committee.